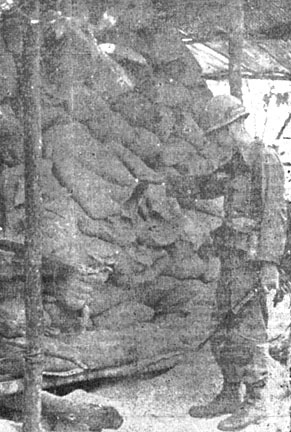 A battalion-size unit of the 25th division uncovered a gigantic 279-ton Viet Cong rice cache recently in troublesome Boi Loi Woods - a cache large enough to feed an 1,800-man VC regiment for seven months. The 279-ton grab - 558,000 pounds of rice - was one of the biggest one-day catches of the war. The battalion-sized unit, moving on the tip from a Chieu Hoi, moved to the vicinity of a VC supply depot while on operation "Kamuela" approximately 20 miles northwest of the division's base camp at Cu Chi. An enemy squad guarding the depot offered only light resistance before fleeing and leaving it unprotected. Moving into the area, the 25th infantrymen found a series of seven caches and collected a total of 279 tons of rice. The rice, packed in 100 pound bags, was evacuated to the division's base camp for eventual distribution to the Vietnamese. Brig. Gen. George G. O'Connor was recently named Assistant Division Commander for the 25th Infantry Division. Before his Vietnam assignment, Gen. O'Connor was the assistant division commander of the 4th Infantry Division at Fort Lewis, Wash. The general, born in Pasadena, Calif., on August 25, 1914, was graduated from South Pasadena High School in 1931. He entered the United States Military Academy, graduating with a B.S. degree in Engineering in 1938. At this time, he was commissioned a second lieutenant in the field artillery. He held several junior officer assignments and attended Field Artillery School before becoming a battery commander in the 52nd Field Artillery at Fort Leonard Wood, Mo., in July 1942. Following five months in this assignment, he became Battalion S-3 for the 52nd Field Artillery,. also at Ft. Wood, from December. 1942 to August 1943. He spent the remainder of World War II in the Pacific, serving as commander of a 53rd Field Artillery battalion from August 1943 to February 1945. Shortly before the end of the war, he was assigned as executive officer and then commanding officer of the 6th Division Artillery, Pacific. He held this assignment until July 1946. Gen. O'Connor returned to West Point as S-3 and executive officer in the Department of Physical Education, where he remained until September of 1950. From June 1951 to August 1954 he was Assistant Chief and Chief of the War History Division in the Office of the War Chief of Military History in Washington, D.C. A year later, in August 1955, he was appointed Chief of Staff, Headquarters, Base Section, U.S. Army, Europe, Communications Zone. He remained until January 1957, before being assigned Group Commander, 36th Field Artillery Group, U.S. Army, Europe. As Chief of the Joint War Plans Division and Deputy Director for Strategic Planning, Director of Plans, Office, Deputy Chief of Staff for Operations, Gen. O'Connor returned to Washington, D.C., and held this position until June 1960, at which time he became Executive Officer, J-5, Joint Staff, U.S. Army Element, Office of the Joint Chiefs of Staff, Washington. Gen. O'Connor became Deputy Chief of Staff, U.S. Army Element, Headquarters, United Nations Command, U.S. Forces, Korea, U.S. Army, Pacific, from July 1962 to June 1963. He was then assigned as Deputy Chief of Staff, Headquarters, Eighth U.S. Army in Korea from June 1963 until September 1964. It was while he was in Korea that he received his promotion to Brigadier General. 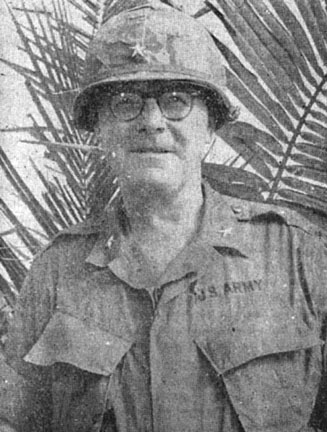 Following Korea, Gen. O'Connor became Assistant Division Commander for Combat Support, 4th Infantry Division, Fort Lewis, Wash., where he remained until coming to Vietnam. ASSISTANT COMMANDER - Brig. Gen. George G. O'Connor recently became the assistant division commander of the 25th. "Unit Day," the 100th Anniversary of the reorganization of the 23rd infantry, was celebrated by the 4th Battalion "Tomahawks" recently in ceremonies at the Cu Chi base camp. The 23rd infantry unit has participated in major U.S. Army campaigns and has been decorated numerous times. The records show that the 23rd infantry distinguished itself in service overseas as well as at home. Manassas, Antietam, Gettysburg, Little Big Horn, Manila, St. Mihiel, Normandy and Korea are but a few of the memories that answer the roll call of the gallant unit. During the ceremony at Cu Chi, Lt. Col. Louis J. 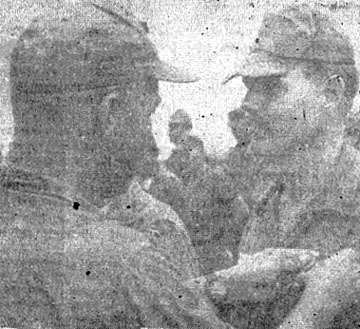 North, commander of the 4th Bn., 23rd Inf., presented Bronze Star Medals for Valor to 1st Lt. James R. Kopp, Sgt. Arthur D. Stevenson, Sp4 Billy D. Berry, Sp4 Edward A. Breadon, and Private James Barret. The colonel then officially designated the day as "Unit Day . . . A day that will henceforth be observed with appropriate ceremonies honoring the history and achievements of the 23rd Infantry." "The men who you see before you today," said Col. North, "serve as proud reminders to us of the 23rd that we are a living part of our unit's proud heritage... We shall continue here in Vietnam to make a history which future Tomahawks can look back upon with pride." An American cannoneer pulled the lanyard on his howitzer and, with a deafening roar, a 105mm howitzer round blasted out into a Viet Cong area. This round, fired recently by Btry. A, 7th Bn., 11th Arty., marks the first time an American artillery unit has fired against the VC in Long An Province. The battery was firing in support of the 4th Bn., 9th Inf., "Manchus" conducting Operation "Lanikai." Lanikai is the first joint United States and Army of Vietnam (ARVN) pacification project ever set up in the Mekong River Delta using American infantrymen. Operation "Lanikai" is setting even more firsts. Since the mission began September 15, the Manchu working with the 50th ARVN Battalion and supporting units repeatedly sweep into Viet Cong dominated areas, demonstrating the increasing weaknesses of the VC in holding their own territory. The units involved scored their first success by capturing VC weapons, booby traps, two flags, a quantity of documents and many suspects. They also have conducted medical civic action programs to aid local area residents. In commemoration of the first artillery firings, the shell casing from the first round will be engraved and presented to province chief, Lt. Col. Nguyen Van Nguu, by the officers and men of Btry. A. The first American-Vietnamese pacification effort in the Mekong Delta is off to a running start. Elements of the division's 4th Bn., 9th Inf., "Manchus" moved into Long An province accompanied by Vietnamese National Police field forces. The units teamed up with the 3rd Bn., 50th Regt., (ARVN) to conduct their first search-and-destroy mission which netted six Viet Cong suspects and numerous indications of VC operation in the area. 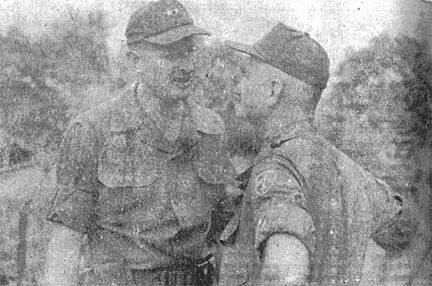 Later, Gen. W.C. Westmoreland, commander, U. S. Military Assistance Command, Vietnam, flew into the province to meet with 25th commander, Maj. Gen. Fred C. Weyand; 4th Bn. 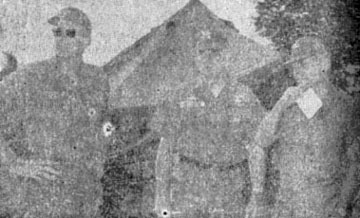 Commander, Lt. Col. Shepherd A. Booth, and Vietnamese province and district officials. The Long An province chief thanked Gen. Westmoreland for the troops and presented an optimistic picture of the future of the province. Long An province was once a thriving and productive area, but has in recent years been plagued by Viet Cong terrorism and taxation. This operation marks the first time the "Tropic Lightning" Division has conducted missions outside Hau Nghia Province with the exception of the 3rd Brigade Task Force and securing operations for the newly arrived 196th Light Infantry Brigade at Tay Ninh. 1st Lt. John R. Ballard, Co. B, 1st Bn., 27th Inf. PFC Walter L. Smith, Co. C, 2nd Bn., 27th Inf. Lt. Col. Michael Barszcz, HHC, 2nd Bde. 25th Inf. Maj. Edwin R. Griffith, HHC, 2nd Bn., 14th Inf. Capt. 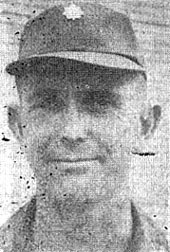 Cedric L. Blackwell, Co. A, 2nd Bn., 27th Inf. Capt. Dennis B. Bulger, Co. A, 65th Engr. Bn. 1st Lt. Jim M. Brogdon, Co. A, 2nd Bn., 27th Inf. MSgt. Ludvick Miller, Co. B, 65th Engr. Bn. PSgt. Benjamin F. Hunter, Co. A, 2nd Bn., 27th Inf. SSgt. Hugh M. Howerton, Co. B, 1st Bn., 27th Inf. Sgt. Jesus M. Garcia, Co. B, 1st Bn., 27th Inf. Sgt. John R. Gilkison, Co. B, 1st Bn., 27th Inf. Sgt. Richard F. Ritch, Co. A, 2nd Bn., 27th Inf. Sp5 James. D. Alexander, Co. B, 25th Avn. Bn. Sp5 Millard J. Atkinson, Co. B, 25th Avn. Bn. Sp5 Thomas F. Lancer, Co. A, 25th Avn. Bn. Sp5 Glinwood McInnis, D Trp., 3rd Sqdn., 4th Cav. Sp5 Robert C. Smith Co. A, 25th Avn. Bn. Sp4 Donald W. Brown, Co. A, 25th Avn. Bn. Sp4 Thomas R. Levanty, Co. A, 25th Avn. Bn. Sp4 Alphonso Trujillo, Co., A, 25th Avn. Bn. PFC Michaele Drennon, Co. A, 25th Avn. Bn. Sgt. T.O. Warden, Co. A, 1st Bn. (Mech), 5th Inf. Sgt. Joseph Washington, Co. C, 1st Bn. (Mech), 5th Inf. Sp4 Timothy P. Kautsch, Co. C, 1st Bn. (Mech), 5th Inf. Sp4 Paul E. Stevens, Co. A, 1st Bn. (Mech), 5th Inf. PFC George E. Chance, Co. A, 1st Bn., 27th Inf. PFC John T. Claybourne, Co. A, 1st Bn., 27th Inf. PFC Moses Ligon Jr., Co. C, 1st Bn. (Mech), 5th Inf. PFC Juan Olmo-Trinidad, Co. A, 1st Bn., 27th Inf. PFC William T. Ryan, HHC, 1st Bn. (Mech), 5th Inf. The control and proper use of money are of great importance here in Vietnam. Illegal currency transactions (black marketing in money) harm our own war effort and the economy of Vietnam. Sound money is a basic requirement for war just as it is for a stable economy. This is why the Military Assistance Command, Vietnam, MACV, in cooperation with the government of the Republic of Vietnam, has issued strict regulations on the handling and circulation of the money in the command. Failure to comply with these regulations can result in severe consequences for the individual and for the nation. The questions and answers in this fact sheet are intended to explain what the regulations are and how to follow them. Q: Why do we use MPC? A: MPC, Military Payment Certificates, or "scrip" are issued in some overseas areas as a substitute for "green" U.S. dollars. MPC is issued in areas, such as Vietnam, where the free circulation of dollars would result in their being siphoned off for purposes which would harm the United States or the host country. The U.S. dollar is one of three international currencies. It will buy goods in any market in the world. Many nations attempt to get U.S. dollars by legal or illegal means in order to buy on the world market. This is particularly true of communist nations which do not have normal trade relations with the free world. It is undoubtedly true of North Vietnam and Red China. There is another side to this problem. Vietnam, like many nations, needs to keep its money at home to provide capital for growth. People in Vietnam who convert piasters to dollars then have a currency which they can get out of the country and invest or bank elsewhere leaving the Vietnamese economy poorer. The use of MPC protects "green" dollars. Q: Who is authorized to have MPC? A: MPC is for use only in U.S. facilities (exchanges, clubs, messes, etc.) and only authorized patrons of those facilities may possess MPC. All MACV personnel will, upon entry into Vietnam, convert all U.S. dollars or instruments into MPC or piasters or both. Q: Why do people who aren't authorized MPC try to get it? A: Two reasons. One, they want to gain illegal possession of the goods and services which can be purchased with MPC. For example, they may try to bribe or con military personnel into buying items for them at the PX. Two, they want to convert the scrip into green dollars, money they can take out of Vietnam. Again, these people often try to do this through military personnel. Q: Why is the legal rate of exchange lower than that of the black market? A: People who don't have faith in their government's currency prefer to have a "hard" currency which holds its value. Also, other people (see above paragraph), want U.S. dollars and dollar instruments for even less legal uses. Q: Where can I convert MPC to piasters? A: Only at authorized conversion points operated by the U.S. agencies, in many billets, compounds, etc. You're tired. You've have a long, rough day in the field and all you want to do when you get back to base camp is take a shower and hit the rack. But they won't let you do it. There's a sign on the company bulletin board that says "Today is Armed Forces Voters Day. All personnel will attend an orientation on 'Your right to vote'." Not this again, you think. I'm dirty, pooped and still thinking about that boobytrap I nearly tripped. Besides, I'm 8,000 miles away from home, eating out of a mess kit instead of a plate, sleeping on an air mattress instead of a bed, and miserable in this 95 per cent humidity. The last thing I'm worried about is who wins the election back in the world. Sounds reasonable, most "Tropic Lightning" soldiers would say. But think about this for a minute. Draft laws, US foreign policy, veteran's benefits are all drawn by men who have been elected to office. What about that letter you got the other day from your wife. She says your congressman voted against the military pay raise. He's up for re-election this November. And she says your kids' school is on double shifts. They're not getting the education they should be getting. There's a bond issue on the November ballot that will provide for three new schools in your neighborhood. But people have to vote for it in order to get those new schools. Are you still thinking about how that voter registration briefing is going to delay your shower? Or have you come to the realization that you're still affected by what's happening back in the real world? And if you've come to that conclusion, do you realize that shouting your complaints to the roof of your tent kit during the nightly bull sessions aren't going to help change the situation one bit? The only thing that can change the status quo is YOU. Men make the decisions that affect your life; you elect the men to make those decisions. The shower can wait a few minutes. That's all the time it takes to see your unit voting officer and fill out an application for a ballot. Remember: Vote, it's well worth-the effort. Outstanding Army inductees and enlistees can look forward to making E-5 after 15 months service under a new promotion policy. The Army has reduced the time in service for promotion to E-5 from 24 to 21 months. A six-month waiver may be granted, further reducing the minimum time to 15 months. Among those affected are inductees of the September 1965 draft call, the first large call in the current build up, who may be considered for E-5 promotion in December 1966, rather than March 1967. The TROPIC LIGHTNING NEWS is an authorized publication of the 25th Infantry Division. It is published weekly for all division units in the Republic of Vietnam by the Information Office, 25th Infantry Division, APO U.S. Forces 96225. Army News Features, Army Photo Features and Armed Forces Press Service material are used. Views and opinions expressed are not necessarily those of the Department of the Army. Printed in Saigon, Vietnam, by The Saigon Daily News. Capt. Ellison B. Vickery, air operations officer for the 1st Bn. (Mech. ), 5th Inf., was presented with the Silver Star and Oak Leaf Cluster during battalion ceremonies. 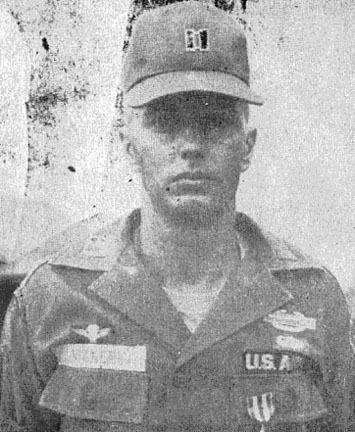 The 27-year-old captain won the first Silver Star for gallantry in action while serving as a company commander on a search-and-destroy mission near Cu Chi. Coming under intense enemy fire from the front and side, Capt. Vickery was wounded. According to the citation, "his aggressive movements under fire inspired his men to increase their efforts and successfully rout the enemy." Throughout the entire battle, the wounded captain continually moved to where he could best control his unit. While leading his company toward their objective, he again encountered hostile fire. Using fire and maneuver tactics, the unit caused the Viet Gong to retreat. For his second award the captain distinguished himself while participating in a search-and-destroy mission near the base camp. After moving approximately two miles from the tactical command post, lead elements discovered a trench line. While commanding Co. B, he ordered his lead vehicle to swing right and check the area to make sure that the company would not be attacked from its flank. After the second platoon completed a turning movement, a large volume of fire from an entrenched automatic weapons position came raining upon the company. Having dropped off a platoon at an ambush site, the company had but two platoons to move against the enemy. Capt. Vickery became involved in the fire fight by moving his vehicle to the trench line. As projectiles bounced off the commander's hatch, he remained exposed to direct his unit and fire his machine gun. Fire poured upon the trench line forced the Viet Cong to run into the oncoming second platoon. Leaving the safety of his commander's hatch after his machine gun jammed, he was wounded. Disregarding his wound, he remained in the open until his machine gun was repaired. Again he began placing a constant volume of fire upon the enemy positions. Meanwhile, one of the second platoon tracks was hit by two recoilless rifle rounds, causing it to become momentarily ineffective. Covering its withdrawal, he moved his vehicle into the position created, thus exposing his armored personnel carrier to possible recoilless rifle fire. Upon completion of the fire fight, he led his company in a dismounted search of the area and turned up several enemy weapons, ammunition and intelligence data. "Due in part to Capt. Vickery's utter disregard for his own personal safety, and calmness under fire, 13 Viet Cong were killed and the mission of Co. B. was successfully accomplished," his citation read. The awards were presented by Lt. Col. Victor F. Diaz, battalion commander. 25th Joins ARVNs to Jump V.C. Shortly after receiving a tip from a "Chieu Hoi," elements of the 25th Infantry Division teamed up with the 1st Bn., 49th Regt. of the Army, Republic of Vietnam, (ARVN), to pounce on the Viet Cong 25 miles northwest of Saigon. Within hours, ARVN and U.S. troops were on the ground in the area where the VC was supposed to be located. Caught by surprise, the enemy was surrounded as helicopters from the division's 2nd Brigade lifted the ARVN unit into the area and a "Wolfhound" jump team from the 2nd Bn., 27th Inf., dropped from the sky. The ARVN unit quickly overcame the enemy, killing four, as the "Tropic Lightning" jump team rounded up more suspects in the area. The ARVN unit also captured one Chicom carbine and several enemy grenades. "The day's operation was a good example of teamwork," said 1st Lt. Thomas Ray, 23, of Waterloo, Ala., assistant operations officer for the battalion. "It gave the ARVN troops a chance to do something with the knowledge that help was there if needed." Lt. Col. Philip D. Haisley, 43, of El Paso, Tex., recently assumed command of the 2nd Bn., 32nd Arty., at the division base camp. Col. Haisley replaced Lt. Col. Leon L. DeCorrevont, who went to the same office Col. Haisley came from, the Office of Chief of Research and Development at the Department of the Army. The colonel entered the Army in 1946 after receiving a bachelor of science degree from the United States Military Academy at West Point. In his 20-year Army career, Col. Haisley has served in Germany at Headquarters U.S. Army Europe, and with the 2nd Arty. Bn. ; in Korea with I Corps Arty. and the 159th Field Arty. Bn. ; and both in Japan and the United States with the 11th Abn. Div. The 2nd Bn., 32nd Arty. "Proud Americans," also have a new Sergeant Major, SMaj. James S. Daniel, 43, of Columbus, Ga. Together, the new colonel and sergeant major preside over one of the most widely flung artillery battalions in Vietnam. Btry. A, is at Xuan Loc, and Btry. B, is at Lai Khe, while HH & Svc. and C batteries are located at Cu Chi. MSgt. Alfred Alfonso, a member of the 25th's 196th Light Infantry Brigade, has been awarded the Combat Infantryman's Badge (CIB) for the third time in his 25 years of military service. Sgt. Alfonso, intelligence NCO with the 3rd Bn., 21st Inf., received. the award after fulfilling the qualifications of 30 consecutive days in combat. He arrived in Vietnam with the brigade on August 4. Sgt. Alfonso earned his first CIB while serving with the Alamo Scouts of the 6th Army Headquarters, Pacific Theater, World War II. He also received the Silver Star, Bronze Star with Second Oak Leaf Cluster and the Purple Heart while assigned to the unit. He was presented his second CIB while serving in Korea in 1949 and 1950. Intimidation never did set too well with Capt. Monroe. For all he cared, the VC could take their threats and go to blazes; be wasn't about to be deterred by a bunch of rag-tag guerrillas. Capt. John R. Monroe, 38, of Honolulu, isn't really a defiant man - he's just determined, to do his job and do it well. The captain is the civil affairs officer for the 1st Bn., 8th Arty. Capt. Monroe's interest in the Tan Hoa area of Hau Nghia province began when his battalion stationed a battery there in early August. He asked the local Catholic priest, Father Loi, to draw up a list of needy people. He planned to assist them with the division's "Helping Hand" program, food and clothing donated by the people of Hawaii. About a month later, Capt. Monroe arranged with Father Loi to come to the hamlet on two successive days to distribute the goods. The first day went without incident. However, that night, Capt. Monroe received some rather unsettling news from Father Loi. The VC had contacted him, the father said, and told him to tell the Americans not to come again. Father Loi said if the American did try to return, the VC would mine the road, ambush them at strategic points and try to kill them by sniping on them at work in the village. Capt. Monroe worked late into the night on the problem. Taking the road into the village was out of the question: He had only himself ; SSgt. John K. Kaaihue, 40, also of Honolulu; and his driver, PFC Thomas Deppen, 23, of Chicago. He called on a unit of the Vietnamese Army (ARVN) stationed near Tan Hoa with a Special Forces "A" team, and together, they worked out a plan to outwit the guerrillas. Their plan was this: Instead of approaching the hamlet by land, they would take to the water. The ARVNs and Special Forces secured the waterfront on both sides of the river as well as the hamlet perimeter itself. When Capt. Monroe landed, everything went smoothly - business as usual. The "Automatic Eighth" civic action team distributed 1600 pounds of wheat, 160 gallons of cooking oil, 785 pounds of powdered milk, 200 pounds of chewing gum, a staple for Vietnamese children. During the two days the team was there 955 of Father Loi's flock received aid from the "Tropic Lightning" artillerymen. But Lt. Col. James W. Cannon's unit sees no immediate end to aid for the hamlet. His unit now takes a collection each payday to pay tuition for children who can't afford to attend Father Loi's church school. Presently, the battalion is donating each month approximately $220, enough to pay tuition for 266 youngsters. Aid projects now on the drawing board include continuing Helping Hand distribution, building a new classroom and converting an old building into a recreation hall at Father Loi's school. Everything is just fine now. AID - A Vietnamese woman refugee at the hamlet of Tan Hoa receives "Helping Hand" aid in the form of powdered milk and cooking oil distributed by the 1st Bn., 8th Arty. 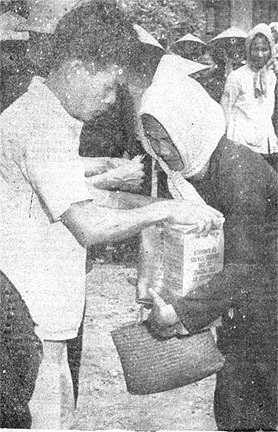 Other Tan Hoa villagers helped with the distribution process. COLD - Capt. 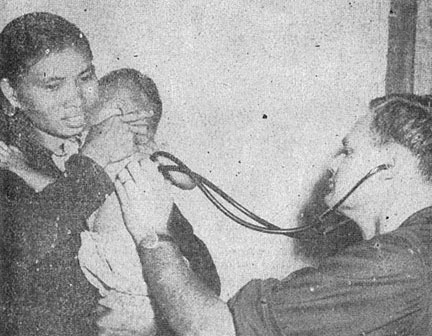 Peter D. T. Clarisse listens to the respiration of a Vietnamese baby. The child was given medicine to relieve a heavy chest cold. FOOD - Men of the 25th Div. Arty. distribute "Helping Hand" items of food to needy Vietnamese in the village of Tan An Hoi. 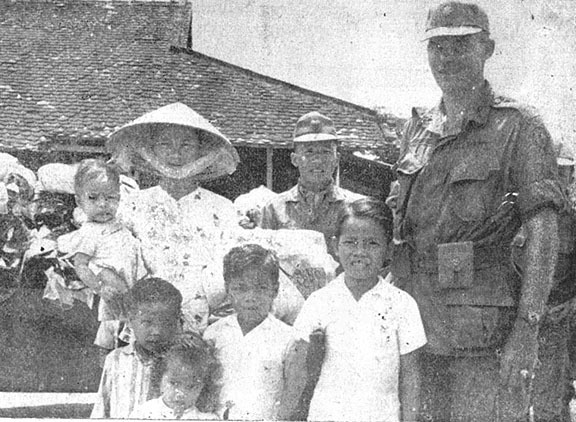 FAMILY - Lt. Col. John R. Hendry, commanding officer of the 3rd Sqdn., 4th Cav., stands with a Vietnamese family in Duc Hoa 15 miles Southwest of Cu Chi, after presenting them with clothing, toys, and candy. A monthly Combat Photography Contest has been announced for amateur photographers of the "Tropic Lightning" Division, starting this month. The top monthly award is $25. Color slides and black and white and color prints, taken with personal cameras, are suitable for entry. Prints must measure at least 2 ¼ x 2 ¼ inches but no larger than 5x7. A limit of three entries per month has been set. Division photo lab personnel may submit only color slides and prints. Contest officials will accept pictures on any subject concerning 25th Infantry Division activities in Vietnam. Participants are reminded, however, that photos containing classified materials or showing restricted areas are not permitted for entry. Pictures of casualties must be accompanied with a signed statement of consent by the wounded soldier. Officials further pointed out that no special treatment, such as retouching, will be allowed. However, use of filters and cropping is permitted. No caption or identification is necessary. In addition to the first place award, a $15 prize is offered for second place, $10 for third and $5 for fourth place. Entries are to be submitted to the commanding officer, 18th Military History Detachment, by the end of each month and the winners will be announced the following day. All entries will become the property of the division. 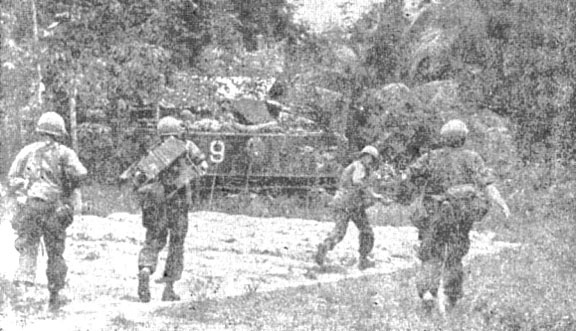 Operating on a routine airmobile assault, the "Wolfhounds" from the division's 1st Bn., 27th Inf., spotted villagers running from them as they landed in the Trang Bang area, 30 miles northwest of Saigon. The Wolfhounds had been in the area on previous occasions and the villagers knew them and respected them. However, the Wolfhounds had learned earlier in the day that there were VC in the area. It was almost obvious that those trying to vanish into the woods were only temporary residents of the village - the type the villagers themselves did not want to have around. As the "Tropic Lightning" infantrymen rounded up the fleeing suspects, one admitted being a Viet Cong. Minutes later, the 1st platoon of Co. C came under heavy sniper fire while sweeping the area. PFC Jerry Shain, 19, of Morgantown, Ky., said his platoon quickly forced the enemy into an open area where helicopters swooped in and killed three of the snipers. The 14-year-old captured VC, a messenger for the 5th VC Company located in the Trang Bang District, later told the Wolfhounds that many of his comrades had been killed in the area of operations within the last mouth. In addition to the three enemy dead and one captured, the Wolfhounds destroyed several tunnels and protective shelters and captured an anti-tank mine. Officer Candidate School averages 23 weeks of intensified training to qualified warrant officers and enlisted men who have an earnest desire to become commissioned officers in the U.S. Army. What schools are there ? 1. Infantry - Fort Benning, Ga.
2. Armor - Fort Knox, Ky.
3. Artillery - Fort Sill, Okla.
4. Engineer - Fort Belvoir, Va.
5. Signal - Fort Gordon, Ga.
6. Ordinance - Aberdeen Proving Grounds, Md. 7. Transportation - Fort Eustis, Va.
8. Quartermaster - Fort Lee, Va.
2. GT minimum score of 110. 3. OCT minimum score of 115. 4. PT minimum score of 300. 6. Two years of high school math is required for attending either Artillery or Engineering OCS. 7. Favorable National Agency check. 8. U.S. citizen or intent to become one. 1. Commissioning as a second lieutenant upon graduation. 2. Pay raise to $303.90 for under two years of service, to $420.30 for over four years. Plus applicable allowances. 3. Opportunity to attend other schools limited to officers. 4. Self-confidence, pride, and developed leadership ability. 5. Increased responsibility and prestige. See your commander. He will give you the details and can provide the necessary recommendation. Airman Second Class Richard Wells of Troy, N.Y., is a weatherman and an unusual one at that. He is assigned to the 5th Weather Squadron, Detachment 28. along with five other weathermen. These men work out of the division base camp at Cu Chi, 25 miles northwest of Saigon. Airman Wells recently was handed the assignment of weather observer for Operation "Lanikai" at Ben Luc, 20 miles southwest of Saigon. Ben Luc is the forward base camp for the 4th Bn., 9th Inf., "Manchu's" and the staging area for all of Operation "Lanikai" pacification efforts. Every hour on the hour during daylight hours, Airman Wells has to bring out his instruments, record temperatures and wind and phone these reports into the main shop at Cu Chi. We followed a well-used trail for approximately 200 yards outside the perimeter until we came to a fork. Just to the left, in the middle of the path, lay a pile of clothes and bones - the remains of a V.C. Capt. Thomas A, Simcox, the patrol leader deployed a squad to search the fork to the right. They were 100 yards up the trail when they radioed that they had discovered two enemy graves which were approximately 30 days old. After they had searched another 100 yards and reported nothing, Capt. Simcox ordered them back. The main body then took to the left fork. Just as we reached a wooded area, it started to rain - not hard, just enough to get you wet. The trees helped shade the sun, but the humidity was still high. The underbrush was so thick at times that the flank guards had to be pulled in, but we kept up a slow, steady pace. Our next halt came when the point man reported what appeared to be an abandoned Montagnard village. After a squad went in and checked, the main body went in and destroyed the huts. There was evidence of use: camp fires, logs placed to form beds and shallow foxholes. All were destroyed so the enemy would not benefit from then again. We moved on and shortly carne upon another, smaller village. After securing the area we moved in and destroyed it also. A couple hundred yards up the trial we discovered an old landing zone used by friendly forces. There were plenty of shell casings (both friendly and enemy type), indicating that at one time someone had had a pretty good fight here. Just outside the LZ (landing zone) our point man discovered three enemy graves. Another 100 yards up the trail, he discovered a larger LZ with fortified bunkers. Capt. Simcox decided to call in mortar fire as the bunkers were situated just right for an enemy ambush. After a few rounds with no sign of enemy activity we cleared the area, secured it and sat down to a lunch of C-rations. At noon we moved out again. All along the trail we spotted recent signs of the enemy: pieces of clothing, spent small arms ammunition, several shallow graves, foxholes, and places on the ground and in the trees where "Charlies" had spent a night. While searching along the trail in a heavily wooded area, we discovered several well-concealed bunkers, a small hut and a makeshift dam in a small stream. The trees provided natural concealment from the air. After destroying the VC's little hide-away, we were soon on our way again. When we heard the roar of swift-moving water, we knew we were closing in on our final objective, the Ia Drang River. Our mission was completed. Maybe we didn't kill any Viet Cong today, but he no longer has several hootches and bunkers to live and hide in, and our intelligence on this area has improved. Tomorrow's another day and it may be different then. When it's 100 degrees in the shade and you're in the field fighting a war, it's miserable. The sweat pours off you even during your breaks. There's no way to avoid it, well, almost no way. The men of Co. A, 1st Bn. (Mech), 5th Inf., have come up with a solution. They go swimming! During a recent 25th Infantry Division operation in the Boi Loi Woods, 45 miles northwest of Saigon, Co. A found a bomb crater made by an estimated 1000-pound bomb. The crater, full of water from the monsoon rains, was approximately 25 yards in diameter and eight feet deep in the center. Upon discovering the water-filled crater, the Bobcats took advantage of a lull in the action and went for a dip in the pool. Coincidentally, the name of the operation the "Bobcats" were on was Operation "Sunset Beach." "I wouldn't be here today if the artillery hadn't been there when I needed it. They tipped the scales in our favor." Capt. Williard E. Harrison Jr., 29, of Baltimore, Md. still shakes his head when he talks about that horrible morning. He knows how close men can come to death and still live to remember it. The spine-chilling nightmare that still haunts Capt. Harrison took place during the 2nd Brigade's Operation "Circle Pines" on the night and early morning of April 4 and 5 in the Ho Bo Woods. Capt. Harrison was in command of Co. A., 2nd Bn., 27th Inf. His unit had been held up and was forced to make camp almost a mile short of the day's objective. The night was relatively quiet although sporadic sniper fire kept the men alert. Several patrols made contact, but that was to be expected in the Ho Bo. "We got hit just after 4 a.m.," Capt. Harrison recalled, "and they hit us hard. My FO began defensive concentrations in the south working first clockwise, then counter-clockwise. It was a lucky thing we started in the south, because right away the artillery knocked out two mortar positions." The artillery had momentarily stalled the attack of an estimated VC battalion. Capt. Harrison took advantage of the pause to move his command post and tighten his defensive perimeter. After a few minutes, the similarly reorganized VC attacked again, concentrating on the southeast perimeter of Capt. Harrison's company. "Artillery fire in the southeast broke up the major portion of the second attack," the captain said. "My men could hear the wounded VC and they heard the rest of the VC so confused by the deadly artillery that they were arguing what to do next. "We had the artillery so close to our own position that the closest rounds were landing only 30 meters away. The VC couldn't penetrate the defensive concentration so they blew a bugle and withdrew. When they went, we kept fire on them as far as we could." That morning, 765 rounds of artillery were fired. The VC were so disorganized they left 30 bodies behind. They had tried to follow Mao Tse-Tung's axiom "Fight only when victory is certain," but they had learned a costly lesson by underestimating the might of artillery. "I feel my whole company is alive today because of the 1st Bn., 8th Arty's support," the Captain said. HONOR - Brig. 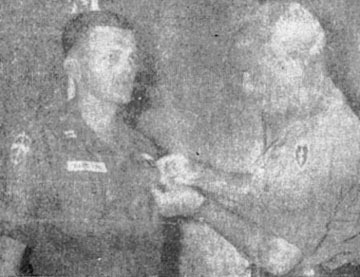 Gen. Glenn D. Walker (r), 3rd Brigade Task Force commander, presents the Silver Star to Capt. Williard E. Harrison, 2nd Brigade assistant supply officer, during a brief awards ceremony held at the 2nd Brigade headquarters. 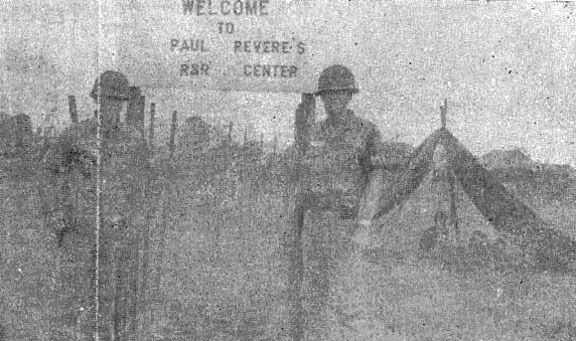 Gen. Walker made the presentation while visiting the 25th division's Cu Chi base camp. They have no standard uniform and they have no formal fire plan, but when the shrill sound of a whistle breaks the stillness, they form into a very effective fighting force. They are the intelligence platoon for the Bao Trai area south of the division base camp at Cu Chi. The platoon works with the 2nd Bn., 27th Inf., using its knowledge of the countryside to find the Viet Cong in their secret holes. On a recent operation the Viet Cong decided to fight rather than hide, and they took on a little more than they could handle. The Army, Republic of Vietnam, (ARVN) platoon was headed for a tree line 50 yards away. The rag-tag platoon had nothing on either side of it but an open field with a tree line and the house in front of them. It had made its way across the field when the VC opened fire from a trench hidden deep in the trees. At the sound of the first shot the ARVN platoon withdrew to cover, still showing no evidence of any organization. Then in the midst of fire, the ARVN platoon leader stood to his full height, drew a whistle from his pocket, blew several sharp notes and in less time than it would take to blink an eye he had his platoon standing in line with him. On his command they began to move toward the tree line through the wall of enemy fire. For a rnomet the fire stopped. This wasn't supposed to happen in the VC plan, but it was happening and the platoon was getting closer. The fire soon began with automatic weapons and grenades. But the ARVNs were undaunted and they had reached the tree line before the Viet Cong knew what was happening. The platoon quickly suppressed the enemy fire and accounted for two VC dead, one VC wounded, and three weapons and 20 grenades captured. There are at least a few VC, those who lived, who have a great deal of respect of the ARVN platoon from Bao Trai. In the words of one American soldier who saw the ARVN charge, "They might stand kind of short, but when it comes to fighting, they fight mighty tall." Department of Defense casualty report shows that 5160 U.S. service personnel have lost their lives in Vietnam from hostile force actions between Jan. 1, 1961. - Sep. 17, 1966, inclusive. An additional 1098 lost their lives from non-hostile action causes. A 25th Infantry Division company recently teamed up with a special Vietnamese "Go-team" and 23 field force police to conduct the second consecutive search-and-destroy action initiated by American troops in Long An province. Co. A, 4th Bn., 9th Inf., led the way on the mission conducted 18 miles southwest of Saigon. Although no contact was made with the enemy, Viet Cong operations in the village of Long An Hiep became apparent with the discovery of 19 foxholes and a number of booby traps. One VC suspect was taken into custody. Composed of 76 local Vietnamese military and civilian officials, the "Go-Team" conducted an initial search for VC in all buildings in the area. One building was found to be protected by a booby trap. Following the sweep, medical teams from the "Mauchus" and the 86th Medical Advisory Team treated more than 100 patients at a Medical Civic Action Program (MEDCAP) held at the Long An Hiep school. In addition, more than 850 bars of candy and bars of soap were distributed to the patients and school children. Protestant chaplains of the 25th recently made it possible for 59 Vietnamese children to receive an elementary education through gifts of text books and other school supplies. The children are all dependents of soldiers of the 2nd Bn., 48th Regt., Army of Vietnam, stationed near the village of Phu My, 35 miles southeast of Saigon. Chaplain (Lt. Col.) George O. Taylor contacted the Protestant chaplains of the "Tropic Lightning" Division. Acting on the request, an appeal was made at chapel services. The response by the Protestant men of the division was overwhelming, Chaplain (Lt. Col.) Alexander L. Paxson stated. With the money, the text books were bought, as well as teacher's kits and additional school supplies such as pencils, paint sets and brushes, and writing tablets. The 2nd Bn., 27th Inf., "Wolfhounds," have reduced the Viet Cong's power to fight and their power to heal in one swift move. Co. C of the battalion moved on information gained from two Chieu Hois who lived and fought in the area of operation. 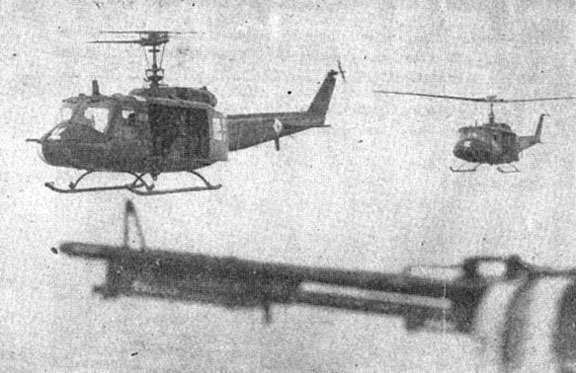 Company C boarded the helicopters and came swooping into the landing zone with machine guns blazing. The startled VC put up weak fire, but soon fled from the advancing Wolfhounds. Within five minutes of landing, a sharp-eyed Wolfhound spotted a covered urn in one of the dikes that ran through the knee-deep swamp. They carefully advanced on the urn and opened the lid to find it full of medical supplies. As the first urn was being investigated, three more were uncovered. The whole cache totaled 143 pounds of medical supplies. The men of Co. C did not stop at their first success. They pushed on through the deep swamp water to a building where another cache was believed hidden. Although the VC put up minor resistance, the terrain was the main enemy. As they headed for the objective, the Wolfhounds had to cross a chest-high canal and then more knee-high swamps. Just as it looked as if they had found all they were going to find, a sharp-eyed Wolfhound spotted something half-hidden in the bushes. A quick search uncovered 477 rounds of various types of ammunition and several grenades. At the end of the day, Co. C boarded the helicopters, and started for home. The VC fired at them in a vain attempt to regain what had been lost, but they had lost and they knew it. In addition to the supplies, the Wolfhounds had killed one and captured one 30-06 Springfield rifle. Seven men from Co. A, 1st Bn. (Mech. ), 5th Inf., received Purple Hearts, and were decorated for heroism during a recent ceremony at Cu Chi. The medals were presented by Lt. Col. Victor F. Diaz, battalion commander, during a formation in the company area. Capt. Jacques B. Gerard, 25, company commander, was presented the Army Commendation Medal with "V" device for heroism. While moving with the tactical command post during a seal and search operation at Trung Lap, Capt. Gerard's armored personnel carrier (APC) struck an anti-tank mine. Damage to the vehicle was extensive with the driver's compartment receiving the full force of the blast. The captain, from Chatham Township, N.J., sustained lacerations of the chin and a severely bruised leg. Ignoring his own injuries, he climbed on top of the vehicle and saw that the driver was unconscious and trapped in the compartment. Realizing that the track could explode any moment, he moved to the severely wounded man and assisted by another member of the crew, removed him from the vehicle. Sp4 Lawrence F. Hadzima, Co. B, was awarded the Bronze Star Medal with "V" device by Maj. James D. Colson, battalion executive officer. Sp4 Charles E. Sheehan, 19, was presented the Army Commendation Medal with "V" device for heroism. While driving an APC on a search-and-destroy mission near here, his platoon was left at the ambush site. Having proceeded a short distance from the ambush site, the company was hit by intense rifle and automatic weapons fire. Specialist Sheehan of Anderson, S.C., took command of the four vehicles in his platoon. Realizing that the company had sustained casualties, he established and secured a landing zone for aerial evacuation of the wounded. By the time the first wounded reached the landing zone, all evacuation measures had been accomplished. Col. Diaz also presented Purple Hearts to members of the company. The medals went to SSgt. 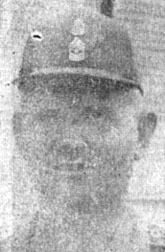 Elmer Dawson of Kinston, N.C., Sgt. Thomas C. Elliot of Rio Linda, Calif., Sp4 David J. Grahek, of Hastings, Minn., Sp4 Dalio S. Snodgrass of Oxnard, Calif., and PFC Vincent Simouelli of Brooklyn, NY.